Studying the best players is a superb way to improve your skill level dramatically. In each of their games are all the secrets of chess – if you know where to look. GM Damian Lemos profiled 6 Super GMs to reveal the techniques, thinking patterns and attitude that makes them so successful. and how to conjure ferocious attacks like Morozevich! From 30 games by these 6 legends, GM Lemos picks out the methods that you can learn and apply to your game straight away to make you a far stronger player. You will also learn how to make the moves that are most difficult psychologically for your opponent and how to steer a game in the direction you want it to go. This series features many breathtaking games of chess and is hugely entertaining but GM Lemos makes sure you get the maximum benefit to your chess education too. The “Legendary Chess Players” bundle is sure to be one of your most prized possessions. Garry Kasparov is one of the most aggressive players in history, constantly playing powerful pressurizing moves until his opponent’s cracked. His aggression is not just in his chess either, he has an aura that intimidated his rivals, resulting in many of them being beaten before they even sat down. Grandmaster Damian Lemos presents a series of classic Kasparov victories, with insight into Garry’s famous opening preparation, his winning chess psychology and the secret to his relentless pressure. Full of fantastic chess and attacking ideas that you can use in your own games straight away. Veselin Topalov is a versatile and formidable player, the FIDE Champion of 2005 and one of the few players in history to exceed 2800 Elo. GM Lemos analyzes and comments on 5 brilliant games to give you a greater understanding of fundamental concepts, including rapidly developing an initiative, converting advantages (for example, converting a strong attack to a strategically won position) and finding the breakthrough in an attack. Topalov’s secrets to success at the highest level are revealed in this inspiring DVD. Ivanchuk is regarded as a chess genius by the public and his peers. The only player to win a tournament ahead of both Kasparov and Karpov in the early 90s, Ivanchuk is creative, unpredictable and incredibly strong. GM Lemos reveals the subtleties to Ivanchuk’s play, showing how deeply he sees into each position and how he out-manoeuvres his opponents. 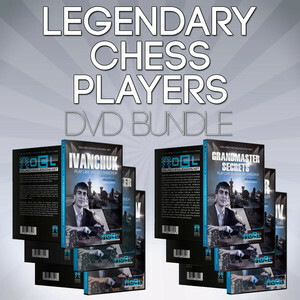 With a phenomenal calculation ability too, Ivanchuk is a player of the highest quality and this DVD is full of instructive moments that will enrich your chess understanding. Alexander Grischuk is another player that has exceeded 2800 Elo, as well as being the Russian Champion 2009 and World Blitz Champion in 2006 and 2012. In this DVD, GM Lemos looks at the aggressive set-ups Grischuk manages to achieve against each opening that he encounters, showing the moves and attitude that you can apply to your own games. With 5 fantastic Grischuk wins, this DVD will teach you how to steamroller your opponent right out of the opening! “GM Secrets – Peter Svidler” delves into the style that has lifted Svidler to the Super GM level, finding a player who has an incredible intuition for critical moments and turning points in a game. GM Lemos shows how Svidler gets an advantage out of the opening, how he adapts to the changing nature of a game and how he infuses each of his moves with dynamism. Featuring 5 games including an awesome win against Korchnoi, “GM Secrets – Peter Svidler” will add another dimension to your chess play. Once ranked second in the world, Morozevich is renowned as an extremely aggressive player with an uncompromising approach to the game – there are very few draws when he plays! GM Lemos analyzes 5 games which will teach you how to actively develop an initiative and long-lasting, relentless pressure from the very first moves. When you have created the maximum tension against your opponent, you need Super GM technique to convert it into a win – and GM Lemos reveals exactly how Morozevich does it!